Soon, Kat's friend and former co-conspirator, Hale, appears out of nowhere to bring Kat back into the world she tried so hard to escape. But he has a good reason: a powerful mobster has been robbed of his priceless art collection and wants to retrieve it. Only a master thief could have pulled this job, and Kat's father isn't just on the suspect list, he is the list. Caught between Interpol and a far more deadly enemy, Kat’s dad needs her help. For Kat, there is only one solution: track down the paintings and steal them back. So what if it's a spectacularly impossible job? She's got two weeks, a teenage crew, and hopefully just enough talent to pull off the biggest heist in her family's history--and, with any luck, steal her life back along the way. A book whose main characters are professional thieves? Sounds pretty interesting. However, I had a couple of problems with this book. The main problem was the story itself. Yes, it immerses the reader into the world of thieves quite well by having a character who had left the life for a time and was just being re-introduced back into it. However, everything is just too easy. When Kat and her cousins decide to steal five paintings from the Henley (in order to give them back to their owner in order to save Kat's dad), the idea is described as an extremely difficult thing to do. In fact, Kat's uncle tells her that it is impossible and that she should just leave the matter alone. And yet their little gang accomplishes the task very easily. That's just one example. And while I understand that the characters are good at what they do, it would be nice for the reader to know a little bit more about how they do it. Then the readers could start making their own plans along with the characters and will therefore empathize more with them. That would have been a great way to do this book. Then there's the main characters. The problem with Kat is the lack of description surrounding how she thinks and feels. For example, there is a complete lack of description about how she reacts to one of the minor characters, Nick, kissing her for a distraction. We aren't told whether Kat kisses him back or even how she feels about the kiss. All is said is that "things are different between them" and Kat's cousins and her best friend Hale describe Nick as Kat's "boyfriend" (though he isn't in any way that). And I genuinely liked Hale... until Kat's cousin gives her a skimpy, tight dress to wear and Hale suddenly notices that Kat has breasts. 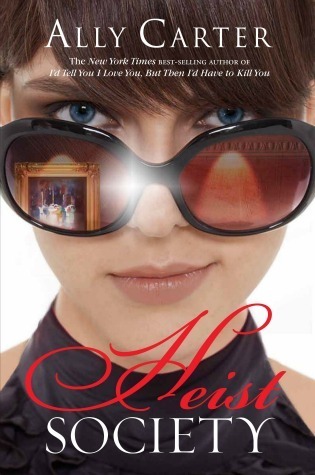 All in all, Heist Society was a very entertaining read. But it wasn't good enough to make me want to read any of the sequels.